The Birmingham Citadel Band (Bandmaster Gavin Lamplough) made the trip to Luton for the first time on 20 September 2014. 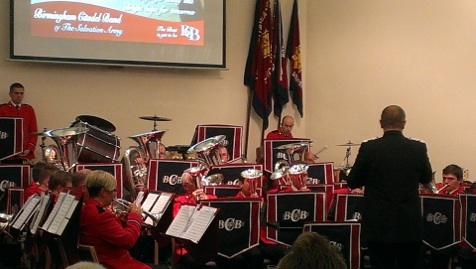 The band was there to play a concert in the modern suite of buildings at the Luton Corps of the Salvation Army. For once, the motorway was “kind” and the band arrived ahead of schedule. After setting up, they enjoyed a lovely buffet before the concert began. The band was delighted to see friends of the band from the London area and particularly pleased to see several colleagues from the International Staff Band. The band has particularly strong links with the Luton Corps, as one of their euphonium players, Craig Hughes, came to Birmingham from Luton and attend the corps there as their church. The band was in fine form and the audience warmly welcomed them after the opening item, Praise Him! (Stephen Bulla). As always, the band’s soloists played wonderfully, with a particularly authentic approach by Deputy Bandmaster Mark Sharman (trombone) in the Latin arrangement of Blessed Assurance (William Himes) which had all the charm and character associated with that genre. Neil Blessett’s (tenor horn) tone was as pure as ever in You Love Me (Paul Sharman), which rang around the hall effortlessly. The showpiece Air ’n Variations (Stephen Bulla) impressed the audience as it was played by David Taylor (euphonium) and Edward Dixon (tuba) brought some light-hearted humor with a particularly flippant rendition of The Bare Necessities. The major work for the evening was the recently extended version of Edward Gregson’s Variations on “Laudate Dominum”. For many, this piece has long been a favorite and for some Salvationists the new version is still a little unfamiliar and difficult to access. But, from a purely musical aspect, the new movements certainly add color and interest to an already much-loved work. This article was posted in News and tagged Birmingham Citadel Band, concert, David Taylor, Edward Dixon, Gavin Lamplough, International Staff Band, Luton Corps, Mark Sharman, Neil Blessett on 16 November 2014 .